Crescent symbols are one of main symbols of Islamic world and Middle East. Nowadays you can see it on flags of Turkey, Algeria, Pakistan, Turkmenistan, Maldives, Malaysia, Mauritania, Tunisia and Uzbekistan. And you can type moon ☽ ☾ text symbols right from your keyboard. I'll show you how to do it by using different techniques depending on your Operating System and tastes. 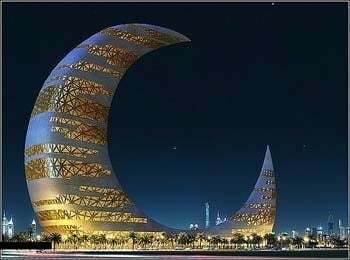 Crescent is one of the oldest symbols known to humanity. It appeared on Akkadian seals as early as 2300 BC and from at least the second millennium BC it was the symbol of the Mesopotamian Moon gods Nanna in Sumer and Sin in Babylonia, Sin being the "Lamp of Heaven and Earth". The crescent was well known in the Middle East and was transplanted by the Phoenicians in the 8th century BC as far as Carthage. Read Wikipedia article to find out more about symbolism of crescent. Configure your keyboard layout in Windows so that you can type all additional symbols you want as easy as any other text. Takes about 5-10 minutes to set things up, but you'll be typing like a boss. You can assign crescent symbols ☽ ☾ and any other text characters to your keyboard using this technique. CharMap allows you to view and use all characters and symbols available in all fonts (some examples of fonts are "Arial", "Times New Roman", "Webdings") installed on your computer. You can input crescent symbols using it. Character Palette allows you to view and use all characters and symbols, including crescent signs, available in all fonts (some examples of fonts are "Arial", "Times New Roman", "Webdings") installed on your computer. There actually are 3 different ways to type symbols on Linux with a keyboard. But only third and fourth level chooser keys and unicode hex codes can produce crescent text symbols.